The Center for Simulation and Innovation at the UA College of Medicine – Phoenix is a state-of-the-art, technology-driven, clinical simulation training facility supporting the innovative educational needs of the medical school and its clinical affiliates, including industry health care partners and the community. This facility is dedicated, in every sense, to providing truly experiential, innovative and immersive simulation education. With 33,000 square feet of dedicated space, the Center for Simulation and Innovation represents one of the largest simulation facilities housed within a university in the U.S. and is a flagship for the University of Arizona and the downtown Phoenix Biomedical Campus. The center supports tens of thousands of learning contact hours each year to fulfill the needs of its primary educational constituents and partners. 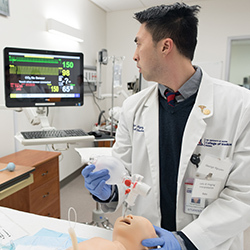 Simulation-based training is integrated into almost every block and clerkship in the four-year medical school curriculum. The center educates 320 medical students in hundreds of simulation-based training events, which can be as small as three students to as large as 160. UA College of Medicine – Phoenix curricular simulation-based training occurs every week of the academic calendar. Other activity within its primary scope includes simulation and training for UA colleges (such as Nursing and Pharmacy); NAU (Physician Assistant/Physical Therapy/Occupational Therapy); Banner Health education for Basic Life Support (BLS), Advanced Cardiovascular Life Support (ACLS) and Pediatric Advanced Life Support (PALS); and resident training for a host of Phoenix-area affiliate hospitals. Frequently Asked Questions about the Simulation Center.